Thread cutting is an alternative to thread rolling that involves producing screw threads using a single-point tool to cut a blank, which is also called a workpiece, as it is rotating on a lathe. However, rolled threads offer increased strength, faster production, less wasted material and a better surface finish than cut threads. Thread Rolling – H & R Screw Machine Products, Inc. In addition the difference between rolled threads and cut threads is visually evident since rolled threads must have larger diameters than the blank rods from which they were made, giving the end of rolled-thread screws a much difference appearance than that of cut-thread screws. Thread tapping, also referred to as CNC tapping, is another method of producing threads. Tapping is specifically used to create inner diameter (ID) threads through the use of a threaded tool that can either cut or form threads in a pre-drilled hole. Industries that benefit from thread rolling and other thread forming processes include electronics, commercial, construction, medical, military, appliance, woodworking and marine. During the thread rolling process, a hard die, which is a device used for cutting out, stamping or forming material, is pressed onto a rotating blank that has been attached to the thread rolling machine. The thread rolling machine gradually increases the force with which the die is applied to the workpiece; the force enables the thread profile to roll from the hard die onto the attached blank. Once the thread profile rolls onto the blank, it caused the metal material to be displaced in order to form the roots of the thread, with the displaced metal flowing outward. The shape or profile of the screw threads that are rolled into the blank is called a thread form. There is an alternative to the traditional thread rolling machine, which is called a planetary thread rolling machine or rotary thread rolling machine. Planetary thread rolling machines hold the screw blank stationary while several thread rolling machines roll around the blank in order to produce planetary roller screws, which are screws that are used in precise applications requiring linear motion. These machines offer high volume production, typically using sheet metal to form the screws. 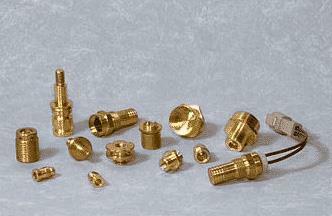 There are two main types of dies used in thread rolling machines: flat dies and cylindrical dies. 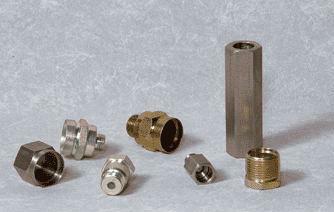 Flat dies are rectangular, simple contour dies that are typically used for machined metal screws, thread tapping and woodscrews. Cylindrical dies can have two or three in-feeds, meaning two or three areas of insertion. Cylindrical two-feed dies are often used for large or balanced screws, while cylindrical three-feed dies are used in applications such as tube fittings or spark plugs. Threaded Rolling Thread rolling requires materials that have good deformation properties, including highly ductile metals such as aluminum and copper and excluding brittle materials such as cast iron.